Most of the Scottish salmon fishing venues have a professional ghillie in residence on the beat to staff the location for the benefit of all visiting salmon fishing guests. Having served my time as a professional ghillie on the River Tay the next few paragraphs highlight a few of the points that I personally believe that makes a resident salmon beat ghillie stand out from the crowd. Most people who choose this glorious river path in life are not doing so from a commercial point of view so I think it's worth establishing that fact from the outset. A professional ghillie will simple love the river in its own right and the tradition of this wonderful sport coupled with the excitement of meeting all types of guests and playing a role in seeing these guests catching salmon throughout the fishing season. A professional Scottish salmon beat ghillie will have a good feel of what makes a salmon beat special and will take a high sense of pride in his daily duties. This self pride can usually instantly be detected upon the arrival at the fishing hut by its condition and state of readiness. A fresh coat of paint, a boiled kettle and a lit fire are normally good indicators of this pride. 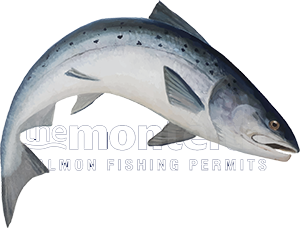 On venues where there could be multiple guest parties arriving a professional salmon beat ghillie will have the ability to manage his rods expertly and accommodate all fishers with a fair fishing rotational system and still play each guest to their own fishing skill ability. As an example of what I'm meaning here an experienced professional ghillie will not place a limited right handed Spey casting guest onto a pool that requires a left handed Spey cast if there's an upstream breeze blowing that could jeopardise the guest's safety. A professional ghillie who's on top of their game will spread his time between each fishing guest and any other required salmon beat duties as best he can throughout the morning and afternoon fishing sessions and not just disappear off somewhere. A professional beat ghillie will never consider picking up his own rod for a cast on the pools his guests are fishing (unless invited) or before his guests arrive in the morning. The best salmon beat ghillies in Scotland will be genuine souls who you'll very likely feel an instant connection with and these men are the true ambassadors of the Scottish rivers and will attract regular returning salmon fishers to their beats. These men will keep an immaculate fishing hut and an observant eye will notice where they've sympathetically trimmed the necessary riverbank bushes and overhanging branches on the pools of their salmon beats for ease of salmon fishing.